Whole wheat flatbread with fresh fenugreek leaves. 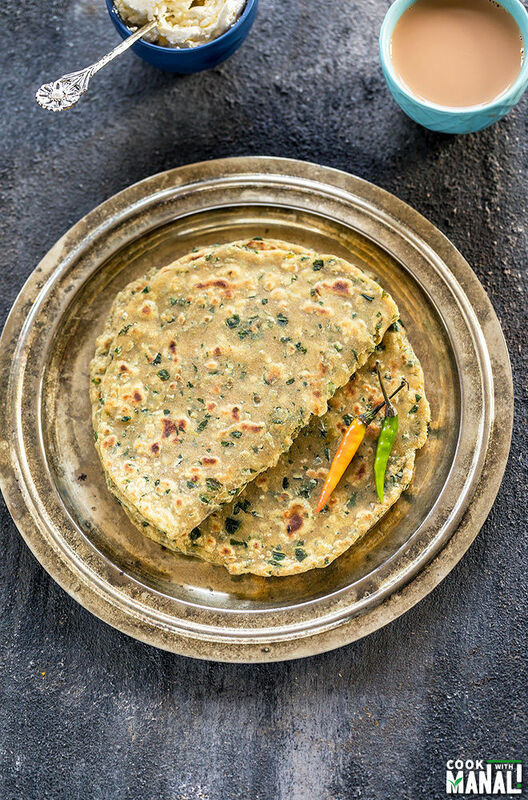 Methi Paratha are delicious, healthy and taste great with pickle or fresh butter! Winters in Delhi are very specific food wise. 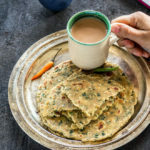 There are certain things which you would see in every house only during winters – like gajar halwa (carrot pudding), maaki ki roti & sarson ka saag (bread made with cornmeal and creamy spiced greens) & these methi paratha! Fresh methi (fenugreek) leaves are in abundance during winters and so they are used in a numbers of recipes during this time of the year. Aloo methi (potatoes with fenugreek leaves) is pretty common but my favorite way to enjoy methi is these parathas. I made them the other day and realized that these are actually one of my favorite parathas and I should make them more often! Have you guys ever cooked with fresh fenugreek leaves? They have a little bitter taste but they taste so amazing once mixed with the flour and rolled into these parathas. Because they are slightly bitter, they are also used in a number of cream based curries like this methi malai paneer. 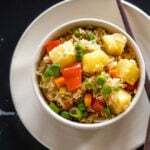 By the way, if you guys have not tried this recipe, I insist you do. It’s one of my favorites! 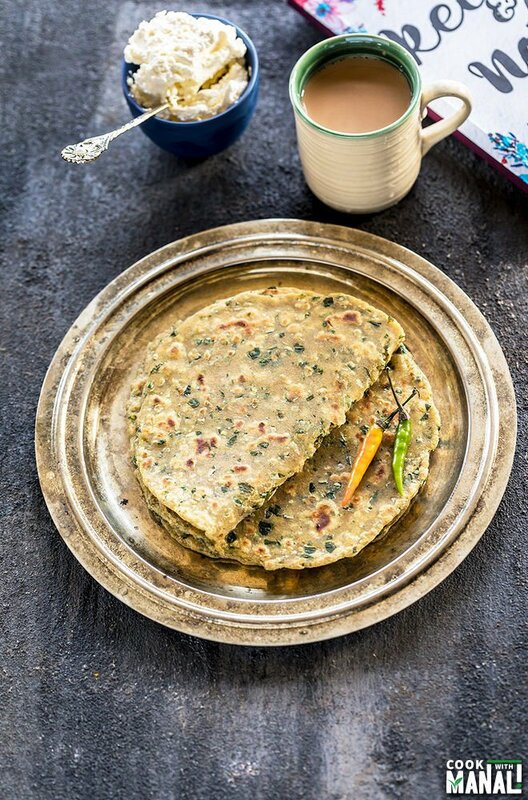 Methi paratha can be made in different ways. 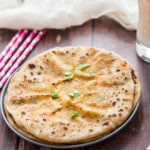 I like mine very basic – I hardly add anything to my parathas because I really love the taste of fresh methi and don’t want anything to overpower it. My mother-in-law grinds the methi to a paste and then kneads the dough with that paste. I like to chop the methi and add to the dough, simply because that’s how it was made in my home so I am just used to it. 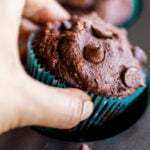 You can make these in anyway you like. If you grind methi to a paste, the resulting parathas will be all green, which definitely looks more appealing. 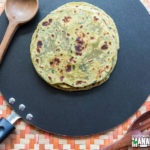 Can you make methi parathas with dried methi? For those who don’t know, dried methi also known as kasuri methi is commonly used as a flavor enhancer in number of Indian curries. One can definitely use it to make parathas but they are no match to the ones made with fresh leaves. Here in the US, you can find fresh methi at Indian grocery stores, I have not seen them anywhere else. So next time you see a bunch of methi, buy it make these methi paratha. I bet your taste buds would thank you! Want more paratha recipes? Check these out! Wash and chop methi leaves. 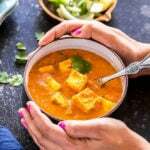 To a large bowl add atta, chopped methi, salt, chopped green chili, pinch of ajwain and garam masala. Add 2 teaspoons of oil and mix everything together. Now start adding water, little at a time to knead it all into a dough. Knead to a smooth dough, it took around 1/2 cup water to knead this. Apply little oil on top of the dough if needed. Roll one dough ball into a round circle of 6-7 inches (I roll it little thin since I like thin parathas, you can roll it slightly thicker). Meanwhile heat a tawa/skillet on medium-high heat. Once the tawa is hot enough, place the rolled paratha onto the tawa. 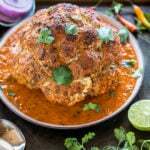 Let it cook from one side for few seconds. Flip over and now apply oil generously on the cooked side. Flip again and apply oil on the other side of the paratha as well. Press the paratha with a spatula or till it’s has brown spots and is well cooked from both sides. Repeat the same steps with the remaining 3 dough balls. 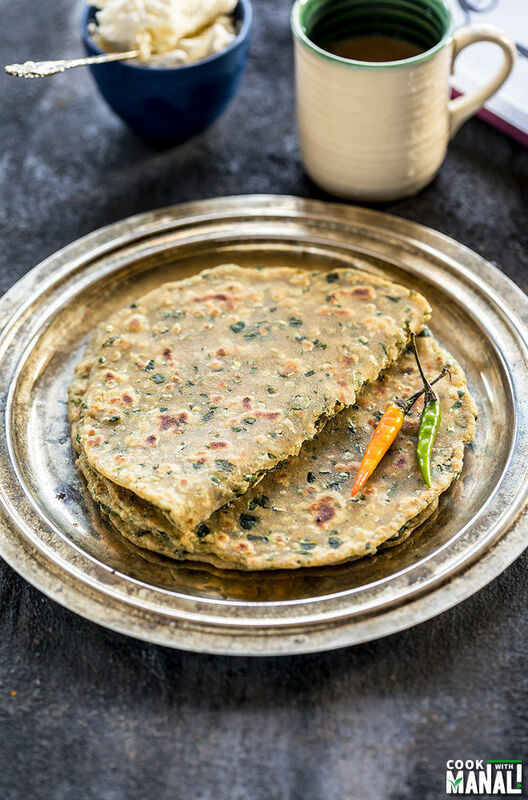 Serve methi parathas warm with pickle, butter or yogurt with a side of chai! 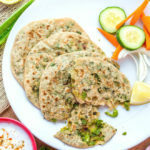 Indian flatbread with fenugreek leaves. 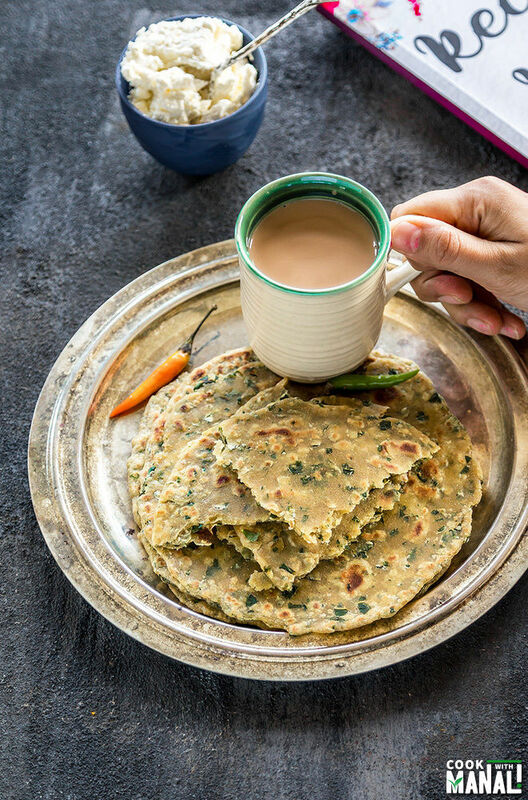 Healthy & vegan these methi parathas are best enjoyed with a side of chai! Roll one dough ball into a round circle of 6-7 inches (I roll it little thin since I like thin parathas, you can roll it slightly thicker). Meanwhile heat a tawa/skillet on medium-high heat. Once the tawa is hot enough, place the rolled paratha onto the tawa. Press the paratha with a spatula or till it's has brown spots and is well cooked from both sides. Repeat the same steps with the remaining 3 dough balls. How yummy! Indian flatbread, stuffed or not, is simply the best!